Electric bicycles for cycle touring in Europe? Last weekend we went to Waiheke Island for the long weekend. We went over on our bicycles and stayed in lovely accommodation in Enclosure Bay. The ‘mission’ we had planned was to test out electric bicycles, as neither of us had ever been on one, and compare the experience with the common or garden variety. Having previously lived on Waiheke, I am well aware of how hilly the island is. Our house was at the top of a particularly vicious beast of an incline and I spent many hours on our deck watching groups of tourists and school children walking their bikes towards our house with expressions of ‘who’s bloody stupid idea was this’, ‘I’m not happy’ and ‘somebody please shoot me now’. These expressions generally included ‘you’ve got to be @$&/!? joking’ when the next hill came into view, which occurred approximately 1 meter past the our driveway. In fact it became a bit of a sport to identify the moment they spotted the hill as they trudged past our house. It always puzzled me why schools from the mainland insisted on dragging their pupils around Waiheke on an annual bike trip. Is there a bullet point in their school strategy that mandates a certain percentage of pupils must be put off cycling for life? Perhaps it’s a misinformed ‘safety’ measure to ensure that pupils avoid bicycles at all costs from that point forward, and focus all of their efforts on getting a car and licence as soon as humanly possible. I cannot believe that anyone in their right mind believes that dressing adolescent kids in oversized fluoro tabards and helmets, until the correct level of ‘dork’ has been achieved, removing all access to ipod and phone and then dragging them up enormous hills in the heat of the day until they have reached the absolute limits of teenage unhappiness, can have any positive effects – indeed, it is probably the cause of the general public perception that cycling is difficult and makes you sweat. So what is the purpose of these trips? Is it perhaps a day for the teachers get their own back on the kids? Although, I have to say that, apart from the teacher in the front (probably the gym teacher), the other staff members generally wore the same expressions as the students. 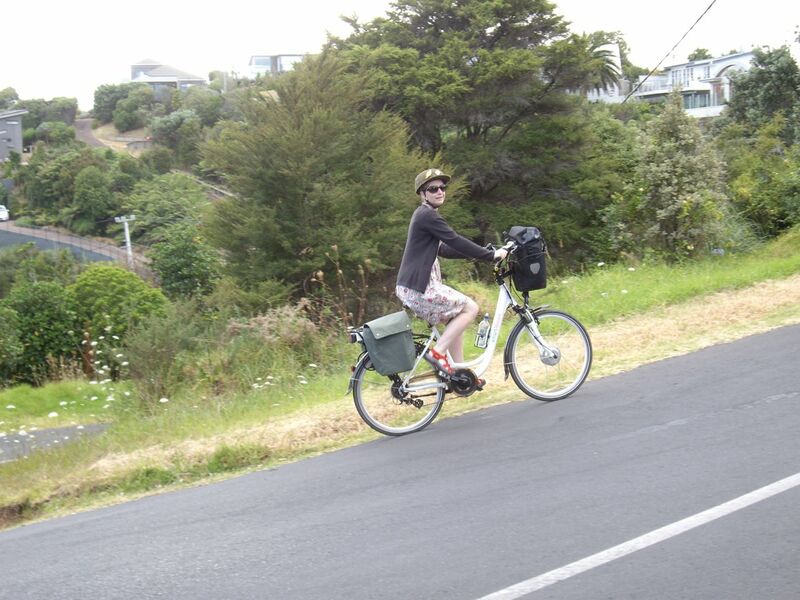 Anyway, getting back on topic, we hired two electric bicycles from EcyclesNZ. The Husband hired a cruiser and I went with a more generic looking step-through. It only really took a moment to get used to the way they worked and after a couple of ‘k’ we were fine tuning our technique. Rob from Ecycles had told us that using just the throttle would use up the battery much quicker than peddling with electric assist. He recommended setting the bike on 2-3 for generally riding with 4-5 for the hills. My interest in electric bikes was not zooming about at great speed but instead the amount of the pain they remove from steep hills. I thoroughly enjoy riding on the flat, downhill is a dream and medium inclines are fine … but there is a point on hills over a certain incline or duration where things turn for the worst – my face goes bright red and nausea sets in. I found that setting the bike on number 1 was sufficient to remove this physical reaction. I used the gears as I normally would and the electric power just kicked in to remove the pain at the end. I found that when I was in the lowest gear, rather than nausea, my superpower appeared. I had bionic legs and failure was not an option! It was amazing; a revolutionary moment! It was like going to the dentist when you knew it wouldn’t hurt, catching a bus when you knew it would arrive at the bus stop when you did, or going shopping when you could afford everything you wanted. Not only was the pain removed but the anticipation of pain was removed. When I knew a big hill was coming up, I had no feeling of dread; the usual game of estimating at what point I would need to get off and walk was no longer necessary. I was totally confident of my superpowers and strangely enough I had a strong impulse, never before experienced, to wear logo covered lycra, a pointy helmet and a small red cape! We had acres of power left over even though we had been everywhere and tackled plenty of large hills (like the one above). We went over to Rocky Bay and searched for a friends house, we had been there before but couldn’t remember its exact location, which was something I would not have otherwise done. In every route decision on a regular bike there is an element of ‘is it worth it?’. On a normal bike, I would not have gone to Rocky Bay and searched for friends that might not have been at home. On an electric bike, no problem. So electric has two benefits that I can see – it removes the pain and extends your options. This of course has raised the question once again of whether we should use an electric or regular bike for the trip. I will have to do a lot more research and of course and I will post what I find. I think it will need a complete post of its own. The other news is that my new shoes, whilst being very comfortable, did not solve the problem that initiated their purchase. When on longer trips, my feet go a bit numb when I am cycling. The numbness goes away as soon as I stop pressing my foot against the pedal but this is of little use as obviously cycling kind of requires you to pedal, otherwise you don’t go very far. I thought this was a problem with the shoes I was wearing, hence the shoe purchase, but apparently not. The shoes I bought particularly mentioned cycling as an activity that they were perfect for so, I have had to come to the conclusion that the problem is not with the shoes but with my feet. If anyone has any light to shed on numb feet – whether my feet will drop off or go green – things like that, or has any ideas on how to fix my feet, please leave a comment. On the plus side, three different people came up to me while we were away, said how lovely my shoes were and asked where I got them. The next trip that we have planned is a camping trip to Leigh to test out our new camping stove. I’m not quite sure when but it will be via hire car I think, so watch this space. I promised in my last post that I would tell you about the book I am currently reading. I have actually got another book out of the library by the same author and am reading them concurrently, which surprisingly works quite well. The first is ‘Greece on my Wheels’ and the other is ‘Dawdling by the Danube’ by Edward Enfield. I am really enjoying his writing style and some parts are quite funny and insightful. He quotes Samuel Butler as saying “Exploring is delightful to look forward to and back upon, but it is not comfortable at the time, unless it be of such an easy nature as not to deserve the name”. This has certainly been my experience and probably the reason I enjoy the build up to a trip – it is often one of the best bits! That is not to say that the adventure is not enjoyable, it’s just that it is enjoyable in peaks and troughs of amazing moments and ‘thank god that’s over’ moments, whereas the planning phase is more of a gentle ‘happy place’ experience. Edward is also a man after my own heart as he’s writes that unlike George Mallory who climbed Everest “because it is there”, he prefers to go around the bottom, if at all possible. His philosophy (which he borrowed off a man he met in Scotland) is, when confronted by a ‘challenge’, walk the other way. He also does not wear Lycra cycling attire as some years back his dentist told him he looked ridiculous, so he rides in normal clothes. At long last I have found reading material that has some relevance to what we intend for the Trip. 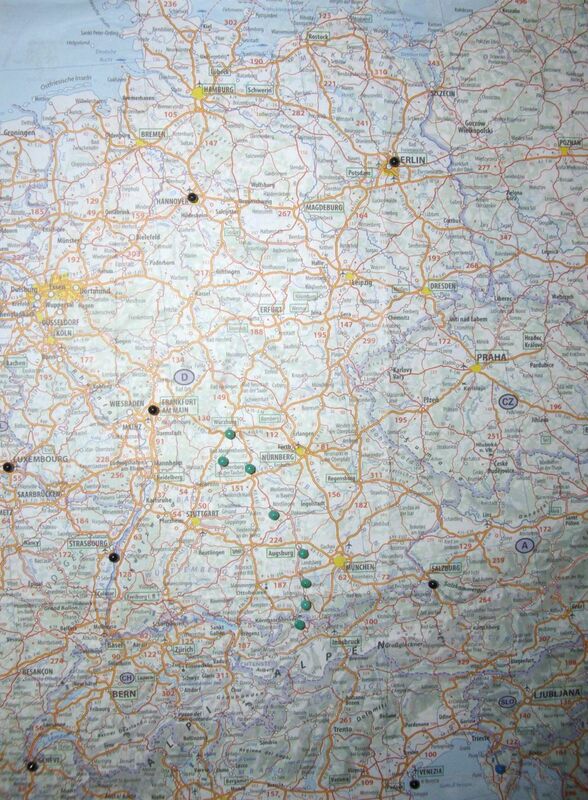 Having read Dawdling by the Danube, I am also now very keen to cycle along the Romantic Road in Germany – I have added it to the map with green pins. The route is actually a lot longer than I imagined but sounds quite do-able from Edward’s description, so it is ‘locked in’. I have been hearing quite a bit about different accommodation and travel options for the Trip so have started a page for these things. If you know of any more please add them to the comments and I will add to the page. I used my garter again for the Waiheke cycle trip and again was very impressed with its performance – this is definitely going to be a ‘must take’ item for the trip. Mental note: must write post on how I made it. Told ya e-bikes were fun! I’ve read a couple of Edward Enfield’s books. You know he is Harry Enfield’s dad, right? The Danube one was enjoyable but I much preferred “Downhill all the way”, it was his first and consequently he was a lot younger. Love his observations and dry humour. I have a buggered ankle and it gives me a lot of grief cycling in stiff-soled shoes. Stiff soles are recommended by all and sundry for “efficiency” but I don’t buy into that. Your feet are designed to flex when walking and I don’t see why cycling should be any different. I now wear Keen sandals and have little joint pain. Rather than the (admittedly harder-wearing) rubber sole of your Keens mine have a running-shoe style sole that offer shock-absorption and an enclosed heal. They look like off-road trainers with holes. Try a long ride with running or walking shoes before you invest in something more stylish. @ Antoine – I saw that he had another cycling book, I’ll see if the library has it. I have some sequin encrusted espadrilles that should be interesting to try as well!